Tim Balster puts on a Family Friendly Halloween Performance! Famed Master Magician, Tim Balster puts on a spooky performance Halloween Night! As a resident of Darien, and a famed magician, Tim will be performing his spooky themed show on Halloween night! 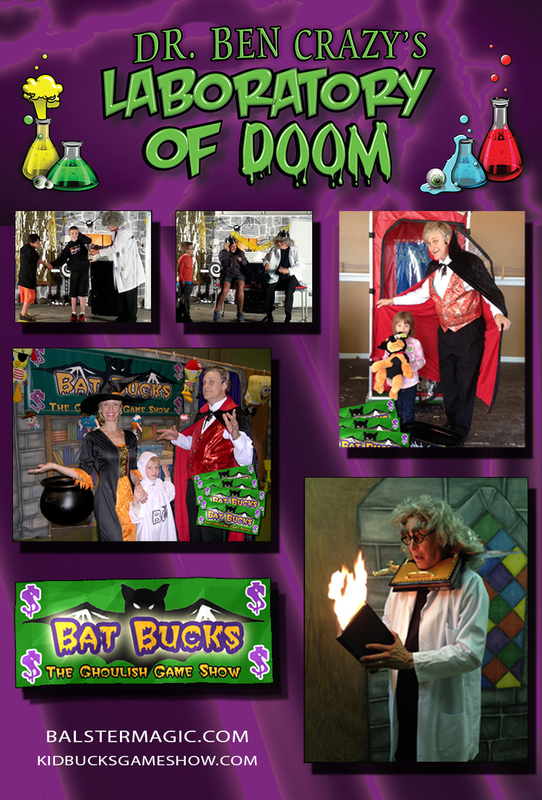 Beginning at 7pm with the ghoulish game show Batbucks then in Dr. Ben Crazy’s Laboratory of Doom. 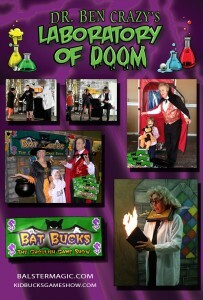 Kid Bucks game show transforms into Bat Bucks for the Halloween season.This show screams Halloween. As the Bat Bucks swirl about the chamber a strobe light is cast upon them creating a dazzling display of Bats flying in the belfry. The winners wheel is decorated as large spider web and is referred to as the “winners web”. All of the games have a Halloween theme or twist to them.The raffle balls used to select contestants are plucked from a bubbling and brewing witches cauldron, even the host and Co-host are clad in Halloween themed attire. Popular seasonal music underscores the mood. Some of the songs include the Monster Mash, Thriller and the theme songs from the movies: Halloween, Friday the 13th, Ghost Busters and Nightmare on Elm Street.This production is a sensational brew of spookiness, comedy, audience participation, fun, and suspense, that will leave you howling with laughter and screaming with delight. Halloween night join Dr. Ben Crazy in his Laboratory of Doom. This show is best suited for those 12 and up. Dr. Ben Crazy has been Crazy for a long time, just never institutionalized! Is he a Doctor of Medicine? Is he a mad scientist? No one is really sure! Take a peek into his laboratory and you be the judge. Numerous zany experiments are conducted during this 30 minute presentation and are administered with a healthy dose of comedy and macabre. Plenty of “subjects” will be needed for the experiments. Hold on to your seat ( and your head) It could be you!